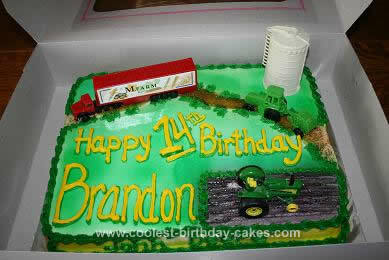 My friend asked if I could come up with a Farm Scene Birthday Cake for her son’s birthday. He was older so I wanted it to be more detailed to what he wanted instead of “little kid” like. I used a 1/2 sheet cake pan and frosted with buttercream. I used Wilton spray color for the the airbrush look. Colored sugar to create the road, and a farm set I bought at local store for the toppers. It was great hit with the birthday boy and friends!